Once blanketed in endless forest, the beautiful Ettrick Valley is one of the last strongholds for true wilderness in the UK. While the woodland swathes may have shrunken since the days of early settlers, it remains a place where the world seems to have passed quietly by. Get out on your bike, however, and its history, myths and rich cultural heritage can be discovered in every nook and cranny. St Mary’s Loch, Neidpath Castle, Melrose Abbey and a peppering of quaint border towns blend amid the beautiful natural scenery, carved by Ettrick Water and the Yarrow River. The banks are dotted with sheep or long-horned cattle and here, when you step from the saddle, you’ll find what you were looking for. 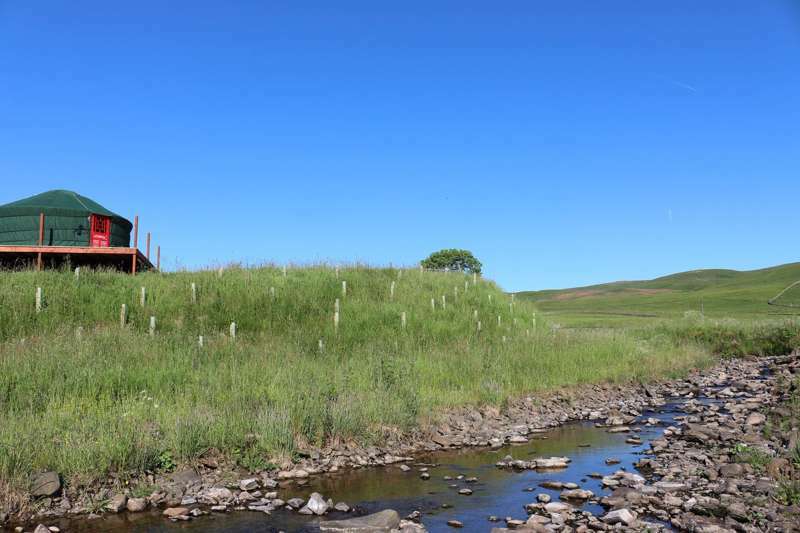 Nestled by the waters that trickle down into the weaving river, Ettrick Valley Yurts awaits. Poised in quintessentially rural Scotland, yet just 70 minutes from Edinburgh, Ettrick Valley Yurts is a glamping experience that offers both quiet seclusion and speedy access to some of the best sights in the region. A network of footpaths, cycle routes and off-road trails make it a wonderfully diverse location, regardless of whether you want to take on the great outdoors, or simply hide away in castles and museums all day long. At its heart, however, the surroundings of the site are only a backdrop. Traditional style Mongolian yurts are warm, welcoming and wonderfully furnished, ideal for a family glamping holiday. 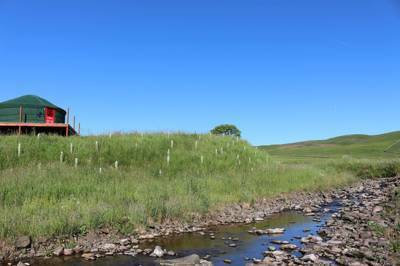 Ettrick Valley Yurts is just a few hundred metres from the river, known locally as ‘The Wild Ettrick’, and closer still to the Newburgh Burn, a trickling stream that babbles through the site. Overlooking the waters, on a raised deck, two yurts accommodate up to six people each and are separate enough from one another to allow guests a private glamping experience. These cosy green abodes blend seamlessly into the lush surroundings, while within, the warm red lattice woodwork is set against the light interior of the canvas. Comfortable beds come in a few different forms: day beds that fold from sofas into king-sized beds, a permanent double bed, a bunk bed and futons, all alongside wooden furniture, tables and chairs. There are also cooking facilities inside that are accompanied by all the crockery, cutlery and utensils you'll need. While the outside decking (complete with BBQ, firepit and picnic table) is an ideal sun spot in summertime, a pre-prepared wood burner awaits inside for your arrival, so all you need do is strike a match, sit back and watch the kids, who won’t take long to be dabbling in the stream. From here, guests can walk around to the back of the yurt where a footpath leads you up towards the main building, where new toilets and showers are found. Next door to the ablutions there is also a small shop and common room with electricity, (including a kettle, fridge freezer and Wi-Fi connection), games and a stash of good books to borrow. The great Scottish setting does come with a caveat or two. Don’t expect to find ten bars on your phone signal and don’t be surprised when a bug or two comes nibbling at the waterside. But using the onsite payphone and lathering on a little insecticide is a small price to pay for this breathtakingly beautiful location – a plethora of historic sites nearby, some of the best fishing in the country and cycle and walking routes fit for anyone with aspirations to enjoy the outdoors. For latest availability and best prices for Ettrick Valley Yurts, please use the Date Search above. From £85 per night. Contact for more details.